The author wishes to acknowledge and thank Skip Kanester for his feedback on the initial client notes and treatment protocol developed for this case report study. Objective: To determine if using Tuina to address organ disharmony is beneficial in achieving a reduction in the intensity and frequency of migraine headaches. Methods: 20 year old male presenting with chronic headaches. Client recorded intensity and frequency of headaches and stress levels daily in a logbook for 4 weeks prior and 4 weeks during the study. Stress level, blood pressure and heart rate were taken before and after each session. One-hour sessions were conducted weekly over 5 weeks. Results: Headache intensity and frequency show slight increase. Overall stress levels shows slight increase. Post-session stress levels show decrease while pain levels increase slightly. After every session the client’s heart rate decreased however his blood pressure rose after the first two sessions and decreased after the next three. Reduction in secondary symptoms related to organ disharmony. Conclusion: Tuina is bodywork that can require a longer period of time to achieve results when the practitioner is working to balance organ disharmonies rather than working to address a specific complaint. Migraine headaches affect more than 29.5 million Americans. These headaches are vascular in nature and occur when excited brain cells trigger the trigeminal nerve to release chemicals causing swelling of blood vessels on the surface of the brain. These swollen blood vessels send pain signals to the brainstem (National Headache Foundation, 2009). According to the International Headache Society (IHS) there are two primary types of migraine headaches, those presenting with aura and those without. General symptoms of migraine headaches include unilateral pain, pulsating quality to the pain, moderate or severe pain intensity, aggravation by physical activity, headaches lasting 4- 72 hours, nausea and/or vomiting, photophobia and phonophobia. Migraines presenting with aura will also have visual, sensory or speech disturbances (International Headache Society, 2004/2005). Since there are no tests to confirm migraine headaches, diagnosis is made by establishing the history of the migraine-related symptoms and eliminating any underlying cause for headaches (National Headache Foundation, 2009). The traditional method of treating migraines is pharmacological. There are three main methods of treatment. The first is abortive or acute treatments. These are medications which are designed to be taken during a migraine to reverse attacks and hopefully stop the pain and symptoms once they have started. Currently there are over 40 different prescribed medications for use in stopping migraines once they start, however not all have been scientifically proven. Examples of acute/abortive treatments include: simple analgesics, combination analgesics, nonsteroidal anti-inflammatory agents (NSAIDs), Opiate analgesics, Ergot alkaloids, Triptans and Corticosteroids. The second category is preventative medications which are designed to be taken regularly, with most being taken daily, to reduce the frequency and severity of migraines. Included in this category are antidepressants, beta-blockers, calcium channel blockers, anticonvulsants and monoamine oxidase inhibitors (MAOIs). The last category is alternative therapies. Included here are relaxation training, thermal biofeedback with relaxation training, electromyographic biofeedback, cognitive- behavioral therapy and herbal/vitamins therapies including the use of Feverfew, Petasites Hybridus, Magnesium, Riboflavin, Coenzyme Q 10, and Melatonin (Rapoport, 2008; Migraine Resource Network). Although the first two categories are the more traditional methods of treating migraines, this last category shows a willingness to try alternative therapies for migraine headaches. Another type of alternative therapy that has shown success in treating headaches is massage therapy. Studies have been done on the efficacy of different types of massage therapy and the various types of headaches (Launso, Brendstrup & Arnberg, 1999; Lipton, 1986; Foster, et al., 2004; Lawler & Cameron; Piovesan, et al., 2007). While these studies were successful, a review of the literature showed only one study that included Tuina as part of an acupuncture protocol to relieve migraine headaches (Hu, Xu & Zhong, 2004). Studies done in China show that Tuina has been used to treat a myriad of conditions such as Fatigue Syndrome (Zhang & Lin, 2003), Constipation (Ruan, 2008), Ankle Sprain (Feng, 2004), Myofascial pain syndrome (Zhang & Wu, 2008) and Cervical Spondylosis (Guo, 2009). In the United States, Tuina has been used to treat back pain, sciatic pain, headache, muscle tightness, frozen shoulder, neck pain, tennis elbow, insomnia, fatigue, constipation, diarrhea, stroke recovery, joint dislocation, poor childhood appetite and even the common cold (Seattle Post-Intelligencer 2007). Tuina (pronounced “twee-NAA”) is a form of bodywork that has been used in traditional medicine clinics and hospitals in China as well as in many other Asian countries for thousands of years. It is commonly used to prevent and treat injuries and illness by removing obstructions and increasing vital energy, called Qi (“chee”), in the body through manual methods and other techniques (Apichai, 2007). Chinese medical theory recognizes a network of important Organs which work together to achieve equilibrium in the body. Chinese medicine bases its logic on organizing symptoms and signs into patterns of disharmony. These patterns of disharmony provide the framework for designing the treatments. The therapy and treatments then attempt to bring the patterns of disharmony back into balance and restore harmony to the individual. When the body is in equilibrium then the person is considered healthy. This theory of health is the Chinese medical attempt to make sense out of the practice of treating illness (Kapptchuk, 2000). There are three Organs which are relevant to this client’s disharmony and are thought to contribute to his primary complaint. These are the Liver, the Spleen and the Kidneys. According to Chinese theory each Organ in the body is associated with specific responsibilities such as flowing and spreading, transforming and transporting, absorbing and eliminating, ascending and descending, activating and quieting. Chinese organ theory is determined by the dynamic functional activity of the Organ rather than the fixed somatic structure that performs the activity. Therefore the Chinese Liver is defined first by the activities associated with it and not by its physical structure. The Liver is said to rule flowing and spreading and is most closely connected with the Blood. At the same time it calms the Qi and keeps it pliable. The Liver’s Blood is essential to balance the Spleen and Liver Qi and all activity that depends on Qi also depends on the Liver. When the Liver becomes imbalanced it can influence the circulation of Qi and Blood. This causes the blood to stagnate (Kaptchuck, 2000; Tyme, 2001). It can also cause the Qi to become rebellious and flow in a counter productive direction. For the Liver this would lead directly to the head and cause headaches. The emotion associated with the Liver is anger. Anger often affects the Spleen and Stomach as well as the Liver. This is usually caused by stagnant Liver Qi invading the Stomach and Spleen. Symptoms from anger are mostly felt in the head and neck areas and include migraine headaches, tinnitus, dizziness, red blotches on the front of the neck, red face, thirst and red tongue (Tyme, 2001). Chronic headaches experienced by the client possibly stem from Liver Qi Stagnation. Assessment also indicated a possible Spleen and Kidney Yang Deficiency as another pattern of disharmony and a contributing factor to his chronic headaches. The Spleen is most closely associated with Qi. It is the Organ by which food is transformed into Qi and Blood and for the Chinese it is the primary Organ of digestion. The Spleen directs “ascending” movement and rules transformation and transportation. Disharmony in the Spleen may lead to Deficient Qi or Blood in either the whole body or in some part of it. The Spleen is the origin of Qi and Blood, helps to create the Blood and controls the Blood by keeping it flowing in its proper paths. The Spleen is the ruler of the muscles, flesh, and the four limbs, and also transports Qi and Blood to them. Muscle tone or the appearance of the limbs can often indicate the relative strength or weakness of the Spleen. The Spleen Qi needs a balanced and calm Liver. If the Liver starts to become stagnate, it can “invade” causing an imbalance of the Spleen. Kidneys store the Essence (Jing) and rule reproduction, growth and development. The entire body and all the Organs of the body need Essence in order to thrive. Thus, the Kidneys are considered the “root of life.” Kidneys have both Yin and Yang aspects. The Yin of the Kidneys is called either Jing or Water. The Yang of the Kidneys is called Ming-men huo or Gate Life Fire. The Kidneys rule Water through their Yang aspect. This Fire transforms Water into a “mist” so the Fluids can ascend or circulate. The Spleen also vaporizes pure Fluids but its vaporization power is ultimately dependent on the Kidney Fire, which acts as kind of a “pilot light.” Because the Kidneys store the Essence they are the foundation of each Organ’s Yin and Yang or life activity. Each Organ depends on the Yin and Yang of the Kidneys. Without the Kidneys being in harmony the other Organs cannot do their specific functions (Kaptchuk, 2000; Tyme, 2001). The objective of this study is to determine if using Tuina to address Organ disharmony is beneficial in achieving a reduction in the intensity and frequency of migraine headaches. Therefore a treatment protocol was developed to move Liver Qi stagnation and tonify the Spleen and Kidneys. The treatment protocol was divided into three distinct parts: Client Supine, Client Prone and Client Seated. Points and techniques were chosen for their ability to strengthen and tonify the affected Organs while addressing the primary complaint of chronic headaches. Prior to the study the client was instructed to keep track of frequency and intensity of his headaches. Frequency of headaches was documented in a daily headache log. Intensity of headaches and daily stress levels were documented in a log and measured using a numerical rating scale (NRS). chronic headaches. He is 5′ 6″ weighing 150 pounds. He works for the U.S. Marine Corps as part of the Motor Transportation Company driving vehicles. Chronic headaches began after a minor concussion owing to a fall at age 7 and began to worsen at age 10 or 11 following the divorce of the client’s parents. At age 12 a doctor suggested taking Advil Migraine. This was discontinued after approximately one year as it had very little effect on relieving pain. Excedrin Extra Strength currently provides relief but is only effective if taken during very early stages of a headache. Headaches reached their peak of severity while in high school causing enough pain to induce vomiting then requiring him to be sent home. Pain intensity began to decrease around age 17 and now the average pain of his headaches reach about a 7 on a scale of 1-10, and no longer cause vomiting. Chronic headaches prevent him from engaging in any strenuous physical activities such as lifting anything over forty pounds or running. However, these actions are performed if they are required for work. Headaches occur once or twice a week. Headaches can be brought on or made worse by stress. Extreme heat, such as the conditions experienced in Iraq, and sudden variations in temperature such as from hot to cold or cold to hot make existing headaches worse but are not a cause. Light, sound and sudden movement may also aggravate existing headaches. Pain starts in the frontal and/or vertex region of the head and then radiates towards the center of the head as the intensity and duration increase. Pain continues in the original locations even once it starts to radiate. Pressure/pain in the eyes and occipital/sub- occipital region is occasionally felt. Client is unsure whether pain is aggravated or relieved by pressure. The client does not start the day with a headache. Headaches start midday and then progressively get worse. On the Brief Pain Inventory completed by the client, words used to describe the pain were throbbing, shooting, stabbing, gnawing, sharp, tiring, penetrating, nagging, miserable and unbearable. The client expressed a desire to reduce the frequency of chronic headaches and thus agreed to participate in a 5 week study to determine the effects of Tuina on chronic headaches. The client is nearsighted and wears contacts daily. Vision was last checked in February of 2009. He exercises three or four times weekly. He does not perspire spontaneously but only after heavy exertion. He smokes one pack of cigarettes a day and has been smoking for five years. He consumes approximately one twelve pack of beer on the weekend which is defined as Friday, Saturday and Sunday. He consumes between three and four coffee drinks per day with each serving being approximately sixteen ounces, and between three and six twenty ounce sodas a day. He eats fast food approximately one to two times a week. He states that he does not drink any water daily. His usual diet consists of eating in the chow hall at the barracks where he lives. He describes his appetite as being “moderately hungry” and says he is thirsty often. He has no preference for either hot or cold drinks. He has no food cravings. He tends to belch often. He did not report any unusual tastes in his mouth but reported a feeling of fullness in his stomach after meals. The client states that he has been experiencing diarrhea at least once a week and that it occurs at random times during the day. This has been going on for at least three or four months and started when he returned home from deployment in Iraq. He does not suffer from any fever or chills and has no aversion to either hot, cold or wind. He urinates between 4-6 times per day and has a bowel movement once or twice a day. He describes his urine as medium to slightly dark yellow. There is no pain or difficulty with urination or defecation. He states that the consistency of his stool is “regular” with no undigested food, mucous or blood present. The client sleeps between 6-8 hours and has no trouble getting to sleep or staying asleep. He claims that he sleeps well, does not suffer from any night sweats and has no dreams or nightmares. Client has a tan, slightly orange-colored complexion with ruddy cheeks. It is undetermined if this is due to him being out in the sun or if this is his normal coloring. His hair is shiny and thick with no dryness, although perhaps very slightly on the oily side. It was noticed that the skin along the tops of his ears was red but the lobes were not. His ear lobes were medium in size and not very thick. His eyes were not very bright and his contacts seem to bother him quite a bit, and they cause him to blink and rub his eyes a lot although it does not cause any redness in the eyes. The client claims they are not dry and he does not need or use eye drops to moisten his eyes. His lips were very slightly more red than normal, like he was wearing lip gloss but not glossy. They also seemed a bit dry. He has a wide gap in between his two front teeth which he says is due to a structural defect in his jaw. He has a slightly narrow jaw and somewhat weak looking chin with a cleft in it. His skin is unblemished and smooth. Overall he appears soft and his muscles are not well defined. He is not overweight but he could be described as having “baby fat.” He tends to slouch or hunch while standing or sitting and he looks down while walking. He moves and speaks somewhat slowly. He is quiet with his speech. He is very passive in his mannerism. Ridges were observed on the fingernails. Socks were worn through the entire assessment. When removed it was found that his feet were very cold to the touch. This is the usual state of his feet although they do not feel cold to him. The temperature of his hands was checked and found to be very warm. This is also normal for him. While observing breathing it was noted that the diaphragm area does not rise very much and that his breathing seems shallow but not in the chest. Palpation of his abdomen reveals it to be soft and resilient. The areas above and to the left of the umbilicus are cool to the touch. The areas below and to the right of the umbilicus are slightly warmer. The client tends to make a lot of exaggerated facial expressions when sharing information but does not use hand gestures. Facial expressions included alternately raising one eyebrow then the other, grimacing, exaggerated eye movements and silly faces that seem out of place. The client was willing to cooperate and answer all questions and seems to have no problem with any questions. The client stated he “feels like he’s ADD” and has trouble concentrating. Further questioning revealed that he has a poor memory for faces, names, and everyday things, but can remember facts. The client did not seem to have a problem concentrating in general. Subsequent conversations with the client uncovered an underlying emotional constitution of anger. It should be noted that in this context “anger” includes such emotions as resentment, irritability, repressed anger, frustration, rage, anxiety, depression, jealousy and animosity. Palpation revealed that the sternocleidomastoid (SCM) was hypertonic on both sides from attachment to insertion causing this muscle to appear flexed while the client was supine. The left side was much worse than the right. This was the only muscle that was noticeably tense upon visual assessment. Tenderness was found in the following points while briefly palpating the body: Tai yang, GB21, GB30, UB36, UB40, UB39, UB57, K10, GB20, LI9, LI10, LI11, LI4, Lu1, Lu2, Lu5, P3, H3, GB29, GB34, Li3, UB60, ST36, ST40 and ST41. 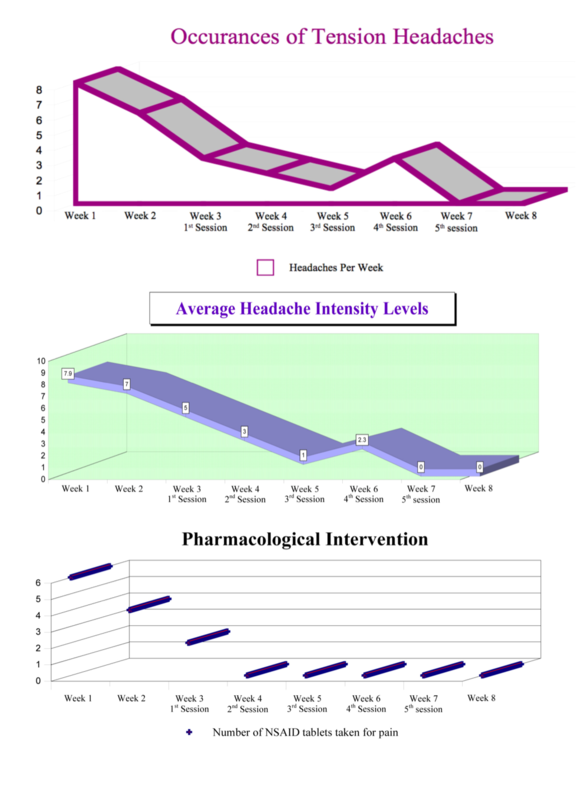 To establish baseline headache measures, four weeks prior to starting the 5-week study the client was instructed to record frequency, duration and intensity of headaches using a daily logbook. The time and date of each headache was recorded. A numeric rating scale (NRS) was used to determine the intensity of the headaches. The client rated the intensity of the headaches on a NRS ranging from 0-10, with 0 indicating no pain and 10 indicating worst/incapacitating pain. The client was also asked to track stress levels using the NRS with 0 indicating no stress and 10 indicating most stressed. Blood pressure and heart rate were taken before and after each treatment for comparison. A NRS measuring pain and stress levels were taken before and after each treatment. The client was asked to abstain from smoking, eating and drinking anything other than water for 2 1⁄2 hours before each session. The following treatment plan was designed to address the primary complaint of chronic headaches based on the Organ disharmony of Liver Qi Stagnation. This treatment plan has a secondary purpose of tonifying the Spleen and Kidneys. The client consumed large amounts of alcohol over the 4 day holiday prior to treatment session. He has noticed an increase in his irritability level and has had bouts of diarrhea following the last session. Swearing has ceased this session and he tried to concentrate on getting through the point work by holding his breath which caused him to turn very red in the face. Practitioner softened the abdominal area by placing a bolster under his knees which made the grasping easier but did not change the client’s initial reaction. There was an increase in the amount of edema in the client’s lower extremities. slower than in past sessions and he now closes his eyes and appears more relaxed during the abdominal work. Grasping of the abdomen was done from the left side of the body instead of the right side as it has been done is previous sessions, and this has resolved the client’s desire to laugh during the treatment. His Ahshi point has moved from the right side of his body to the left side in the same location. His edema has decreased slightly in the lower extremities. The client fell asleep during hand rolling on the back of body which is the first indication of him being truly relaxed. There was no change in post- session pain seen with change in protocol but client requested to keep the new protocol. Unlike before the previous sessions the client smoked 1⁄2 hour prior to the beginning his treatment. He consumed more alcohol over the weekend than in previous weekends and he was exposed to 2-chlorobenzalmalononitrile or CS gas over the previous week. He no longer has the digestive problems he complained about prior to starting the sessions and following the first session, however his sleep has been disturbed making him more tired than usual. He experienced more discomfort during the session than in previous sessions. He was advised to keep his eyes closed and concentrate on his breathing. As a result the abdominal work was deeper and easier this session than any other. There was an increase in edema in his lower extremities. Post-session client requested information on how drinking water and improving lifestyle could change the quality of the treatment sessions. The most notable difference this session is that the client did not consume any alcohol this weekend but opted instead to drink a bottle of water and abstained from smoking the day of his treatment. Since last session he has been sleeping more soundly but has been feeling irritable and getting mad for no apparent reason. He was relaxed throughout the session, breathing deeply without coaching. No Ahshi points were found on the back. No edema was seen in the lower extremities. Post-session the client requested to continue bodywork sessions after termination of the study. Figure 4. Headache intensity was recorded for 4 weeks prior to treatment and for 4 weeks during the study. reduction in stress (Figs. 1, 4 & 5). Post-session data shows a decrease in stress upon completion of a session and a slight increase in pain after a session (Figs. 2 & 3). After every session the client’s heart rate decreased, however his blood pressure rose after the first two sessions and decreased after the next three (Fig. 6). It is interesting to note that despite the weekends of heavy drinking and exposure to CS gas during the study period the frequency of headaches remains relatively consistent. Although the data suggests little to no improvement the client reported feeling more relaxed throughout the study. He no longer had the problems with his digestion that were reported when he first started the study. His feet were warmer and no longer felt cold to the touch. He started drinking water and sleeping more soundly. He experienced irritability throughout the study which is an emotion associated with the liver and which you would expect to see while working to balance this Organ (Kapptchuk, 2000). Figure 6. Blood Pressure and Heart Rate measurements taken before and after each session. At first glance the results of this study might imply that treating migraine headaches by addressing a client’s Organ disharmony or disharmonies via Tuina is ineffective. However based on the client’s other physical improvements and the manifestation of specific emotions during this study such as improved digestion, improved sleep, warmer extremities, reduction of edema and the feelings of irritability, it appears the treatments were addressing the correct Organ disharmonies. The protocol was designed to address disharmonies of the liver, spleen and kidneys. Improved digestion and the reduction of edema could be seen as a result of tonifying the spleen while warmer extremities could be seen as a result of strengthening the kidneys. Feelings of irritability are not unusual while working on the liver and would be expected to manifest during the course of treatment. Lifestyle and diet are important factors in Chinese medicine and ideally a client would adopt a healthier way of living during and after receiving treatments (Kaptchuk, 2000). It is probable that this client’s lifestyle choices during the treatment period contributed to his symptoms. A review of the literature reveals most Tuina protocols are administered over a much longer period of time than was given in this study (Zhang & Lin, 2003; Zhang & Wu, 2008; Zhang, 2003). It is suggested a longer study period be used in determining the efficacy of Tuina on migraine headaches and Organ disharmonies. when the practitioner is working to balance Organ disharmonies rather than working to address a specific complaint. Elimination or relief of the primary complaint may not be immediate however secondary symptoms may be relieved. While the objective of the study was not achieved, the protocol was working to address the correct Organ disharmonies. Apichai, B. (2/8/2007). Alternative medicine: Tuina: ancient pain relief meets modern life. Seattle Post-Intelligencer. Retrieved April 29, 2009, from http://www.seattlepi.com/health/302749_altmed08.html. Feng, G. (2004). Treatment of 20 cases of ankle sprain with tuina combined with physical therapy. Journal of acupuncture and tuina science, 2(2), 51-52. Foster, K. A., Liskin, J., Cen, S., Abbott, A., Armisen, V., Globe, D., et al. (Sept/Oct 2004). The trager approach in the treatment of chronic headache: A pilot study. Alternative Therapies, 10(5), 40-46. Guo, Y. (2009). Treatment of 157 cases of cervical spondylosis of vertebral artery type by tuina therapy. Journal of acupuncture and tuina science, 7(2), 113-115. Hu, W., Xu, s., & Zhong, L. (2004). Observations on the effect of tuina plus acupuncture for cervical migraine. Journal of acupuncture and tuina science, 2(4), 50-52.
International Headache Society (Comp.). (2004/2005). The International classification of headache disorders. Oxford: Blackwell Publishing. (2nd Edition). Kapptchuk, Ted J. (2000). The web that has no weaver (2nd ed.). New York: McGraw- Hill. Launso, L., Brendstrup, E., & Arnberg, S. (1999). An exploratory study of reflexological treatment for headache. Alternative therapies, 5(3), 57-65. Lawler, S. P., & Cameron, L. D. (2006). A randomized, controlled trial of massage therapy as a treatment for migraine. Ann Behav Med, 32(1), 50-59. Lipton, S. (1986). Prevention of classic migraine headache by digital massage of the superficial temporal arteries during visual aura. Ann Neurol, 19, 515-516. Piovesan, E. J., Di Stani, F, Kowacs, PA, Mulinari, RA, Radunz, VH, Utiumi, M, et al. (2007). Massaging over the greater occipital nerve reduces the intensity of migraine attacks: Evidence for inhibitory trigemino-cervical convergence mechanisms. Arquivos de Neuro-Psiquiatria, 65(3). Retrieved April 30, 2009, from http://www.scielo.br. Rapoport, A. M. (2008). Acute and prophylactic treatments for migraine: present and future. Neurological Sciences, 29(Suppl. ), 110-122. Ruan, Y. (2008). Summarization of constipation treated with tuina therapeutics. Journal of acupuncture and tuina science, 6(1), 62-64. Student manual of the fundamentals of oriental medicine (4th ed.). (2001). In Tyme (Comp.). La Mesa, CA: Living Earth. Zhang, J. (2003). Treatment of fatigue syndrome by tuina: A report of 79 cases. Journal of acupuncture and tuina science, 1(4), 51-52. Zhang, J., & Wu, Y. (2008). Clinical study on treatment of myofascial pain syndrome with ashi points. Journal of acupuncture and tuina science, 6(6), 347-351. Zhang, J., & Lin, Q. (2003). Treatment of fatigue syndrome by tuina: A report of 79 cases. Journal of acupuncture and tuina science, 1(4), 51-52.